Steel twin screw motor vessel, built and engined by Cockerill’s of Hoboken in 1934 (Yard No. 650) for the Belgian Marine Administration’s Ostend service. 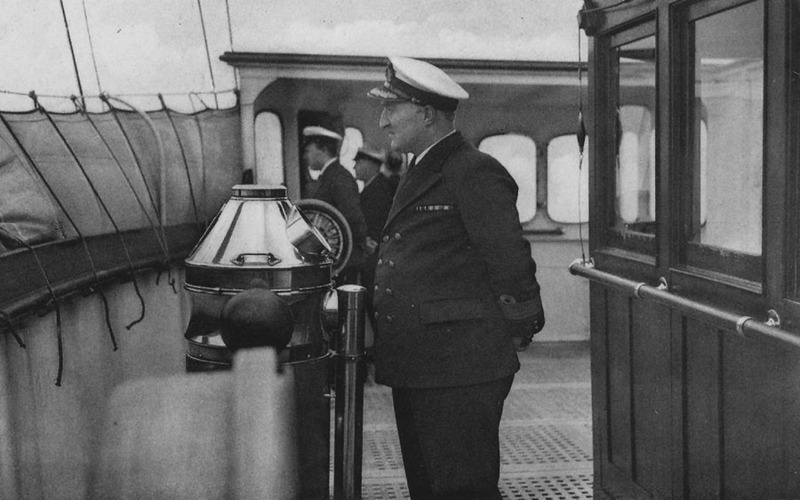 August 2nd 1934: Sea trials. August 1934: Delivered to Regie voor Maritiem Transport, Oostende, Belgium. August 12th 1934: On her first trip she suffered engine problems and had to be returned to her builders for repair. November 17th 1934: Sea trials after repair. 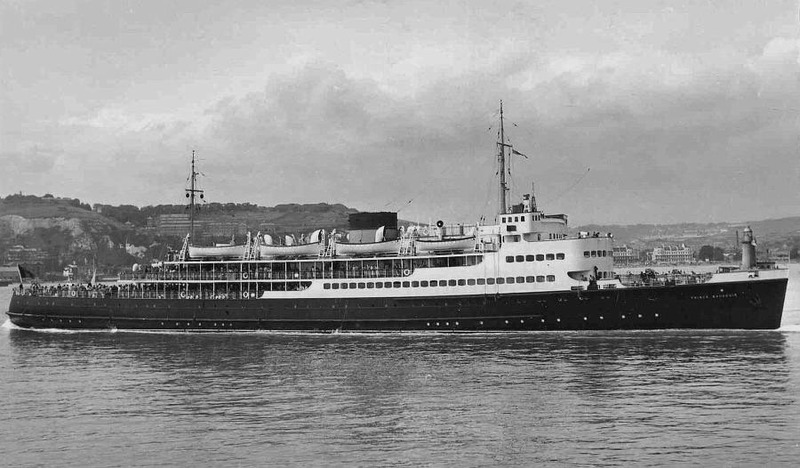 November 1934: Commenced service between Ostend – Dover. 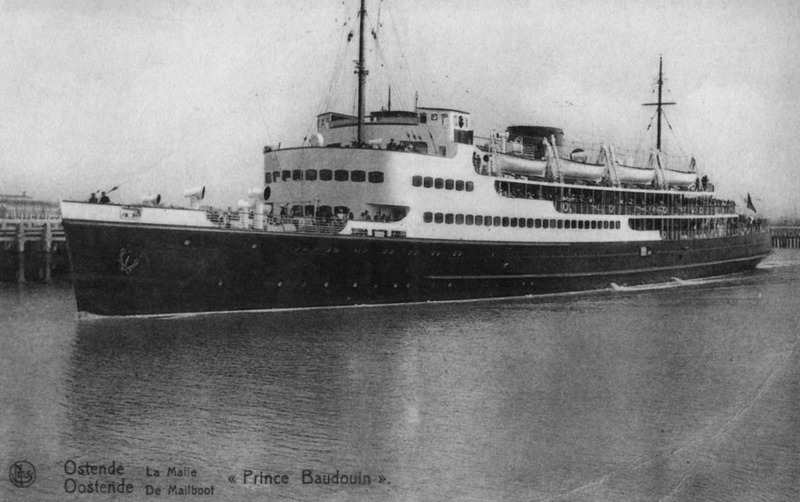 July 26th 1936: Chartered for one trip between Le Havre – Normandy. March 2nd 1938: Ran aground in Ostend. September 4th 1939 – May 7th 1940: Operated between Ostend – Folkestone. 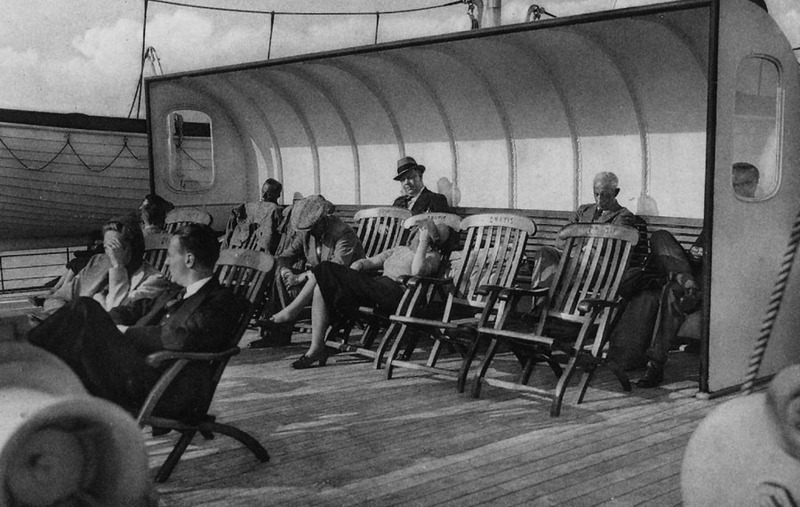 May 18th 1940: Left Ostend for Southampton, via Le Havre, carrying refugees. May 28th 1940 – July 24th 1940: Commenced service with the Ministry of War, England. June 11th 1940 – June 17th 1940: Took part in the evacuation of Cherbourg, Brest and St Malo. July 25th 1940: Chartered to the Royal Navy as a Fleet Air Arm Torpedo Target Vessel (although never employed as such). July 1940 – August 1941: Laid up in Southampton. 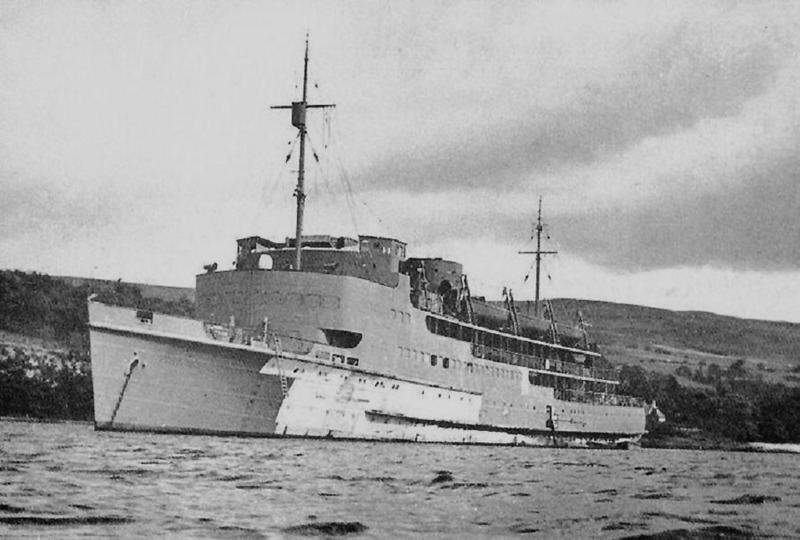 October 31st 1941: Sailed for the Clyde and after colliding with two merchant ships (MAHSUD and GRASLIN) she was moved into Gareloch. October 3rd 1941: Left the Clyde for North Africa. October 30th 1941 – November 25th 1941: Repairs in Capetown owing to damage caused whilst refuelling. December 1941: Operated as a troopship to North Africa between Alexandria and Tobruk. March 1st 1942: Despatched from Port Said to Famagusta for transport duties to Haifa. March 12th 1942: Ordered from Egypt to move Indian brigade group from Cyprus to Palestine. March 17th 1942: Sent to the Red Sea, but considered unsuitable for Eastern Mediterranean service. April 11th 1942: Remained at Port Said. August 31st 1942: Sailed for the U.K.
November 29th 1942: Arrived in the Thames. January 25th 1943 – November 8th 1943: Rebuilt as an infantry assault vessel at Green & Silley Weir, Ltd, Tilbury. November 8th 1943: Commissioned as HMS PRINCE BAUDOUIN. November 24th 1943: Left the Thames heading for Scottish waters. March 1944: Based on the English South Coast. June 6th 1944: Took part in the Normandy Landings. July 11th 1944: Left Solent for Cardiff. July 24th 1944: Left Falmouth for Naples. August 3rd 1944: Arrived Naples. August 1944: Took part in the invasion of southern France. August 25th 1944: Arrived in Naples the Augusta (Sicily). September 6th 1944: Left for Gibraltar. September 14th 1944: Arrived the Clyde to await orders. October 1944: Laid up when it was discovered that one of her generator crankshafts had broken and a replacement might take up to six months to manufacture. March 1945: Sent to her builders. May 2nd 1945: Extended refit ready for anticipated service in the Far East. October 13th 1945: End of hostilities and she was paid off. October 13th 1945: After being reconditioned, handed back to Regie voor Maritiem Transport, Oostende, Belgium. November 1945 – June 1946: Extensively refitted at Cockerill, Hoboken, Belgium. July 24th 1946: Special sailing to commemorate the centenary of the service between Ostend – Dover, then recommenced Ostend – Folkestone. 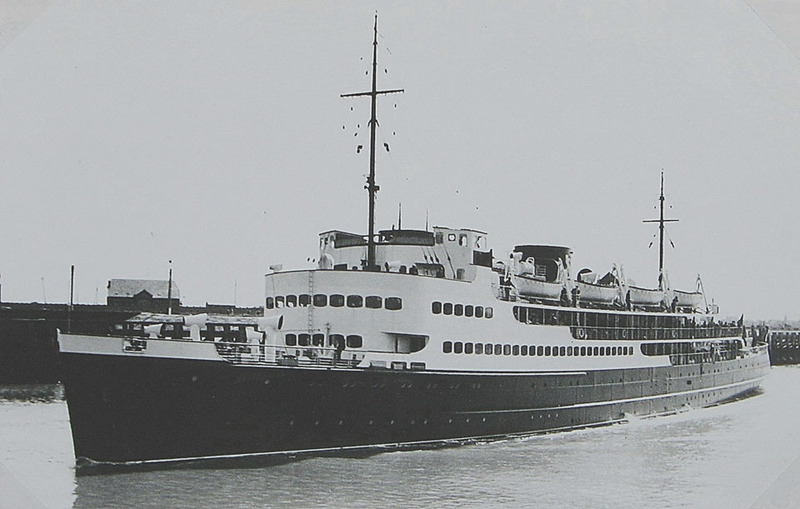 October 1946: Re-commenced commercial service Ostend – Dover. December 30th 1946: Collided with the breakwater in Dover, suffering damage to one of her propellers. November 14th 1947: Suffered a minor engine-room fire as she arrived at Dover. 1964: Laid up in Zelzate. September 6th 1967: Arrived at Heyghen Freres, Ghent, Belgium for scrapping.